The goings-on of a lonely stray cat are rarely enough to make the TV news - but this hopeful kitten figured out a perfect way to get her story on the air. Reporter Nima Shaffe was on location for WXYZ-TV Channel 7 in Detroit this morning when an unexpected visitor decided to drop by with some breaking news of her own. Smack-dab in the middle of Shaffe's segment on Gun Safety Week, the tiny kitten moseyed within earshot and began to meow. Here's a brief portion of what microphones picked up. Once the broadcast ended, the news crew discovered the kitty, who, sadly, appeared to be all alone. Naturally, she stole their hearts - so much so, in fact, she became a story. Later in the broadcast, Channel 7 anchors returned to Shaffe in the field to learn more about the creature who'd tried so hard to interrupt him earlier - now named, appropriately enough, Lucky Seven. The kitten is now at the Humane Society of Huron Valley, where she will be placed up for adoption in the coming weeks. But, thanks in no small part to her public debut on live television, folks have already come forward hoping to give her a forever home. Judging from how she's handling her newfound stardom, it seems interrupting the news segment may have all been part of her plan. 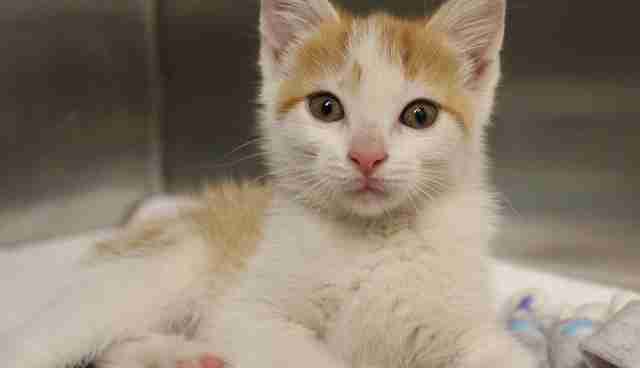 "Lucky Seven is a super affectionate and friendly kitten," a spokesperson from the shelter told The Dodo. "She was purring and 'making muffins' with her paws the entire time she was being examined by our veterinarian, and now is relaxing comfortably in our nursery, awaiting a foster to come get her." Click her to follow Lucky Seven's progress, and to learn more about other adoptable pets in the Detroit area.